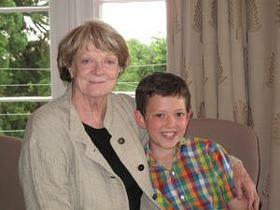 A very special boy recently had his Harry Potter dream come true thanks to Make-A-Wish UK and Dame Maggie Smith. Evan, aged nine and living with a twisted cervical spine & Heptoblastoma (liver cancer), wished to meet Dame Maggie Smith after being inspired by her performance as Professor McGonagall in the Harry Potter films. He was over the moon when he found out his wish was going to happen, and just before Dame Maggie entered the room he whispered to his Mum “I think I’m gonna faint”! Maggie agreed to meet Evan, who was diagnosed with liver cancer on Christmas Eve 2010 after experiencing appendicitis-type symptoms, at a local hotel in Cambridge. She arrived laden with gifts for Evan, including his favorite Cadbury Caramel chocolate and a baby cactus plant, and spent two hours chatting to him over afternoon tea.